1. Preheat oven to 350 degrees F. Spray 30 mini muffin cups with nonstick cooking spray. Combine flour, baking soda, cinnamon and salt in a medium bowl. Stir applesauce, sugar, oil and egg in large bowl until well blended. Add flour mixture; stir until blended. Spoon into prepared muffin cups, filling three-fourths full. 2. Bake about 16 minutes or until toothpick inserted into centers comes out clean. Cool in pans 10 minutes; remove to wire racks to cool completely. 3. Line baking sheet with waxed paper; spray with nonstick cooking spray. Place peanuts on plate or in shallow dish. Insert craft sticks into tops. 4. Place unwrapped caramels and milk in large microwavable bowl; microwave on high 2 to 3 minutes or until melted and smooth, stirring after each minutes. Working with 1 cupcake at a time, hold cupcake over bowl and spoon caramel over cupcake, rotating stick until completely coated. 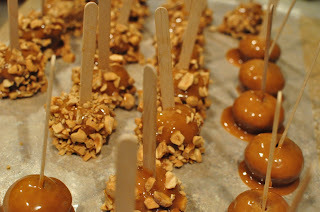 Immediately roll in peanuts to coat cupcake, pressing nuts lightly with fingertips to adhere to caramel. Stand cupcake (stick side up) on prepared baking sheet. Repeat with remaining cupcakes (caramel may need to be reheated briefly if it becomes too thick). 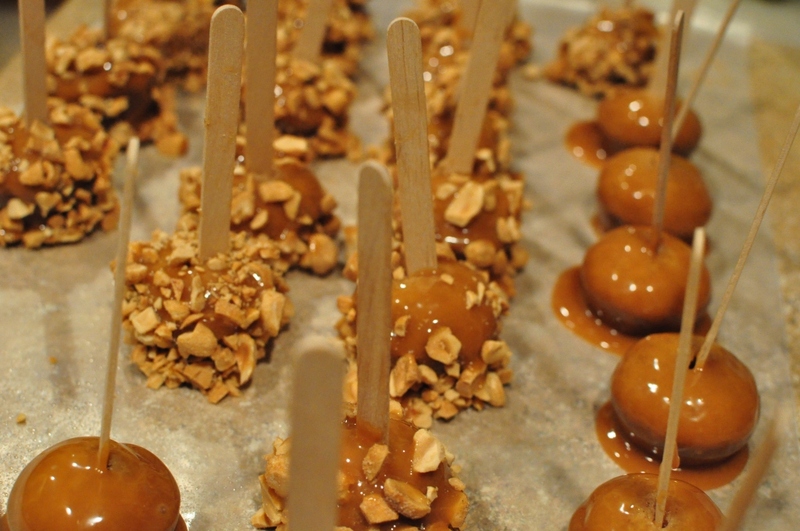 Let stand 20 minutes or until caramel is set.